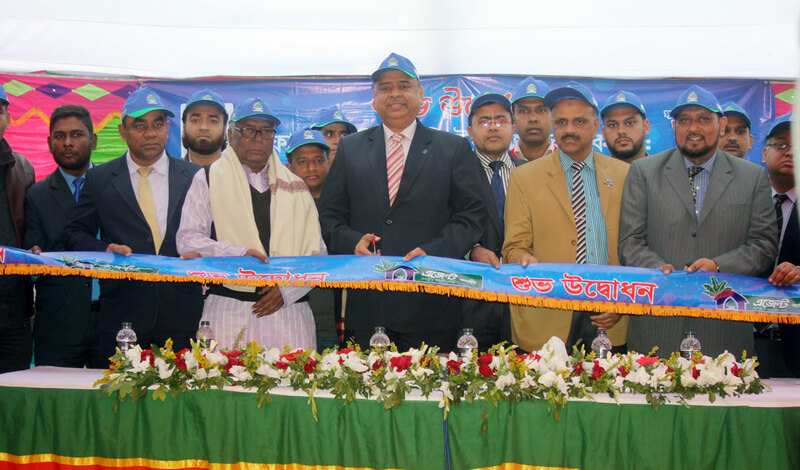 Agent Banking Outlet of First Security Islami Bank Ltd. has started its operation on January 15, 2019 at Bunagati Bazar, Shalikha, Magura. Mr. Syed Waseque Md Ali, Managing Director of First Security Islami Bank Limited inaugurated the Agent Banking outlet with the massive presence of the social elites and locals. Among others, Mr. Md. Mustafa Khair, Deputy Managing Director, Mr. Md. Abdur Rashid, Khulna Zonal Head, Mr. Ali Nahid Khan, Head of Alternative Delivery Channel Division, Mr. Md. Faridur Rahman Jalal, VP of Agent Banking & Mobile Banking, Mr. Md. Mofizur Rahman, General Manager of Magura Palli Bidyut Samiti, Mr. Md. Bakhtear Udding Laskar, Chairman of 6 no Bunagati Union Parishad, Mr. Md. Akram Khan, Principal of Bunagati Degree College, Mr. Olip Kumar, Headmaster of Bunagati Amzad Ali High School, Mr. Md. Kamal Hossain, Manager, Khajura Bazar Branch, First Security Islami Bank Ltd. and Proprietor of Agent Zobaida Traders were present on the occasion. A Doa Mehfil was also performed on the occasion.